Coming back to your car to find it blocked in by an inconsiderate driver is amongst the most frustrating things that can happen to a motorist. Sitting, wasting your day, wondering if the owner is ever going to return is enough to make anyone see red. 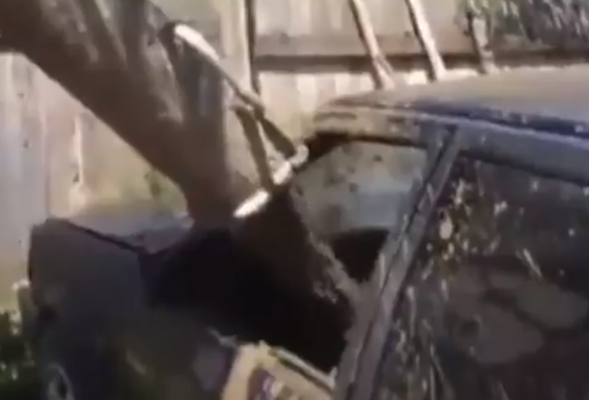 In Russia (surprise, surprise) motorists aren't quite as patient, as this video handily demonstrates. Returning to find his Chrysler 300C blocked in by an anonymous saloon car, the owner flips, and attacks the car with a baseball bat, destroying the wing mirror and smashing the driver's side window. Rolling the car out of the way, the maniacal motorist then decides to teach the poor parker a lesson he'll never forget and calls on his cement-truck driving mate. What follows is a mess that no amount of dashboard shine is ever going to polish out, as the truck driver aims the cement dispenser into the car. Click play below to watch the suspension-squashing carnage unfurl.